Types of Magnesium Supplements: oral, topical, IV and IM. These supplements may help when dietary intake from foods is not enough to raise magnesium levels. All types of magnesium supplements have a laxative effect which varies from very mild to very strong depending on a supplement. Most labels advise to start supplementing with a quarter of a daily dose, slowly work up to a full dose and break down the daily dose into several portions. Success in raising magnesium levels with the oral supplements depends greatly on solubility and absorption rate of a particular supplement. The average absorption rate is about 40% under normal conditions which is slightly lower than that of dietary magnesium from foods. Oral magnesium is the most well-known and popular out of the three types of magnesium supplements because of a large variety of forms to choose from and hassle free use as powders, capsules or mineral drops - something that everyone who takes supplements is used to. Magnesium oxide – an inorganic salts form with the highest content of elemental magnesium (60%), but with very low bioavailability as only 4% are absorbed. Such low absorption is the reason behind a strong laxative effect of this magnesium supplement. Despite its low bioavailability, this is the form used in most multivitamin formulations, and the form most widely used in medical research. It is not surprising because it is also the cheapest form of oral magnesium. Magnesium chloride – an inorganic salts form, but with better solubility than magnesium oxide because chloride in this formulation produces extra hydrochloric acid (the acid already present in the stomach) that helps absorption. Magnesium citrate – a chelate where magnesium is combined with citric acid (citrate). Citric acid can be found in fruits and vegetables to which it gives a strong sour taste (e.g. lemons, limes). Citric acid is a component in the energy production process in the body. This form of magnesium is easily absorbed and the laxative effect is mild. Magnesium malate – a chelate where magnesium is combined with malic acid (malate). Malic acid can be found in fruits and vegetables to which it gives a pleasant mild sour taste (e.g. apples). Malic acid participates in energy production too, just like citric acid. This form of oral magnesium is very soluble and highly absorbable. The laxative effect is mild as well. Magnesium citramate – a chelate where magnesium is combined with both citric and malic acids. Magnesium taurate – a chelate where magnesium is combined with the amino acid taurine. This form is highly absorbable because taurine is able to transport magnesium through cell membranes. This form of oral magnesium is known for extra calming and relaxing effect on the body and is often prescribed for patients with heart disease. The laxative effect is even less than magnesium citrate, so this form is favored by those who already have loose stools. Magnesium glycinate - a chelate where magnesium is combined with the amino acid glycine which happens to be a glutathione precursor. Dr. Russell Blaylock warns that glycine may increase the toxicity of free glutamate, another amino acid which is a glutathione precursor. People who are extremely sensitive to MSG (a form of glutamate added to many processed foods) should be cautious when using this form of magnesium supplement, although he mentions that the levels of glycine in magnesium glycinate are very low. Magnesium mineral drops – this form of supplemental magnesium is a complex of ionic trace minerals derived from either salt lakes or seabed with most of sodium removed. Magnesium is one of many minerals in such drops along with traces of potassium, chloride, boron, lithium, calcium, iodine, phosphorus, manganese, iron, copper, zinc, chromium, molybdenum, vanadium and other minerals. The taste of concentrated mineral drops is very strong. To mask the taste these drops can be added to filtered water to improve its taste, or to homemade electrolyte drinks, fresh juices, smoothies, etc. The daily dose can also be divided and taken throughout the day. 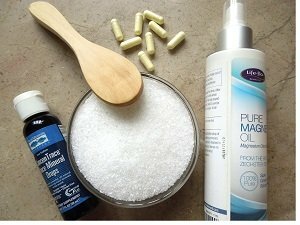 Topical or transdermal types of magnesium supplements are a great option in addition to oral magnesium if you do not tolerate oral magnesium well, if loose stools become a problem, or if there are digestive issues that prevent the absorption of dietary and oral types of magnesium supplements. Topical magnesium is easily absorbed through the skin and is taken up by cells bypassing the digestive system. Magnesium concentrations vary by the form of the topical magnesium: magnesium oil, gel, lotion, bath salts and Epsom salts. Magnesium oil – this is not exactly an oil but a highly concentrated solution of magnesium chloride and water. Magnesium chloride feels greasy when diluted in water, hence the name – oil. This form of topical magnesium is the most concentrated one – 1 teaspoon provides 560 mg of magnesium. You can buy commercially prepared magnesium oil or make your own by dissolving magnesium chloride flakes in boiling water at 1:1 ratio (preferably distilled water to prolong the shelf life of your oil) and putting the solution into a spray bottle for convenience. Magnesium oil can then be sprayed and rubbed into the arms, legs or torso. Magnesium oil may cause slight irritation that may result in burning and itching sensations. This problem can be solved by wiping off excess salts from the skin with a damp washcloth after the solution is absorbed, by breaking down your daily dose into several applications, or by adding extra water into your oil to reduce concentration. Magnesium gel – this is a convenient, less runny form of topical magnesium to be rubbed into the skin. The only drawback is that ingredients may include substances that you may not wish to be absorbed into your bloodstream. As always, read the labels. Skin irritation mentioned above may occur as well. Magnesium lotion – this low concentration form is a great option for children and people with very sensitive skin. But again, like with magnesium gel, check the label for unwanted ingredients. If you wish to make your own magnesium body lotion using your DIY or commercial magnesium oil, there are plenty of tutorials and recipes online. Magnesium bath salts (bath flakes) – this form of topical magnesium can be used in relaxing baths and is also well tolerated by people with sensitive skin. Bath salts are pure magnesium chloride plus other naturally occurring trace minerals. For best results 1-2 cups of salts can be dissolved in warm water and the bath should not exceed 30 minutes. Epsom salt – Epsom salt is not the same as magnesium bath salts. Epsom salt is 100% magnesium sulfate which is used as a saline laxative if taken internally, but only occasional use is recommended. Epsom salt cannot be used to make magnesium oil; however, it can be used in baths or foot soaks just like magnesium salts – 2 cups of Epsom salt to be dissolved in warm bath water. Magnesium concentration is 495 mg per teaspoon. 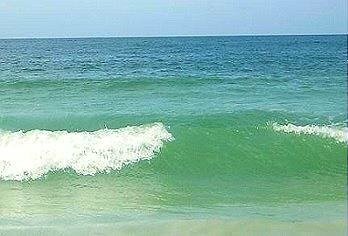 Sea/ocean water – regular swimming in the ocean can be an effective way of increasing magnesium intake through the skin. This method is not available to everybody, but if you are lucky to live by the sea, do swim a lot! It is not only enjoyable and calming - it provides extra magnesium to your body. If you are on vacation, skip the crowds at the amusement parks and head to the beach. Note that sunscreen may prevent magnesium absorption from sea water. The above two types of magnesium supplements (oral and topical) do not necessarily require a prescription. 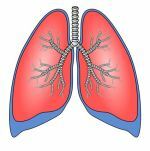 Magnesium shots, either intravenous (IV) or intramuscular (IM), on the other hand, can only be prescribed by a doctor and administered in a medical setting. This therapy may be prescribed when neither dietary, oral, nor topical types of magnesium supplements worked in restoring optimal levels of this mineral. Magnesium shots are also used in cases of certain heart disease emergencies when a rapid increase of magnesium levels is necessary. Of all the types of magnesium supplements Ray has decided in favor of magnesium oil and Epsom salt foot soaks, the latter also recommended by his neurologist for peripheral neuropathy pain relief. We also add magnesium mineral drops into our filtered drinking water and include foods high in magnesium into our diet regularly. Before you decide to supplement with any of these types of magnesium supplements, talk to your doctor, especially if you have a health condition. People with kidney diseases, heart diseases, obstructed bowel and GI tract diseases should be very cautious when taking magnesium supplements.